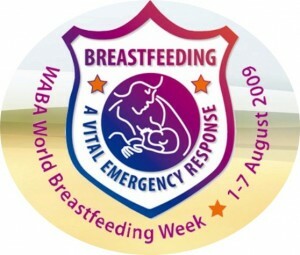 Today is the first day of World Breastfeeding Week and we are SO EXCITED!! To celebrate we are having a week long party on our blog. 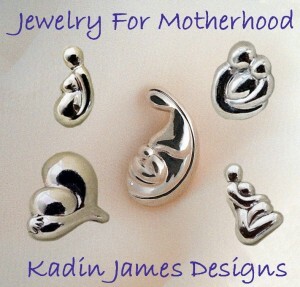 1) We are launching a great new line – Intertwined Love ~ Mother & Child by Kadin James Designs. The designs are spectacular and we are so excited to have them all! We love this collection so much that we even had a special design custom made exclusively for our boutique! The collection consists of five pendant designs (shown in the photo) and two rings! We’ll need your help naming our new piece – so stay tuned for more information on that (coming up on Monday). We’ll also be doing a giveaway of one of these great pieces AND some of the “samples” we had made when trying to come up with this design. Check back on Monday for complete details!! 2) We are having daily specials in our boutique. These will be items that are on sale for one-day only. Each special will be announced at the end of the blog post for that day – so stay tuned for some great deals!! Today’s special is on our favorite dress – the Vanna Tank Dress. 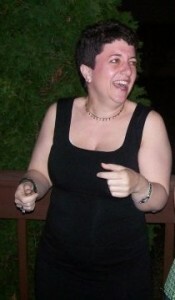 The photo shown is me wearing this beautiful dress and dancing away! It is stunning and your friends will never know it is a nursing dress. Better yet – it is also a maternity dress – so you can wear it while pregnant and after the baby comes for discreet breastfeeding. Enter code VANNA and save 30% on this great dress!! This special is good today and tomorrow only (Aug 1-2), so shop early before it ends!! 3) We will have some great guest bloggers being featured this week too! So stay tuned for more info! We are so excited to celebrate breastfeeding with you! To kick off the celebration – please leave a comment on this post letting us know how many kids you have and how long you breastfed each of them. Comments on this post will be entered into a drawing later in the week for a great super-secret prize – so be sure to leave one! My 15 year-old nursed until he self-weaned at about 40 mos., and my 4 year-old until she self-weaned at 42 mos. My 16 month-old is still going strong!! I’m so glad there’s a week to celebrate breastfeeding. I live in California and am always surprised at how closed minded some of my friends are. My 1 year old is breastfeeding and still loves it. All of my friends and co-workers are surprised that I’m still breastfeeding. It’s so good for babies that I can’t even imagine stopping him. We’re going to keep going. My 5yo nursed for 19 months. My 2.5yo nursed for 9 months. My 7 month old is exclusively breastfed. I have two children. I nursed my first until she turned three and I am still nursing my 28 month old. I have two kids. The oldest was breastfed until he was 20 months. He weaned himself when I was 8 weeks pregnant with his younger brother. My youngest is two weeks old, and I’ve been nursing him from the start! I plan on continuing as long as he wants. I have one little boy who just turned one last week. We have been breastfeeding now for 12 months and are still going strong. I’m not sure when we’ll wean but right now, neither of us are ready so I’m just taking it day by day. It’s been such a positive experience and I am so glad I decided to do this. It is one of my greatest accomplishments to date. My daughter “Peeper” and I got of to a really rough start with breastfeeding, but we hung in there, and nine months later, we’re still going strong, with no plans to stop any time soon! I am first time mom plugging away at breastfeeding. My baby is 5 months and 3 weeks. I am planning to go at least 18 months. I must say this road has been a bumpy and long in such a short period of time. Thank God for resources such as lactation consultants and blog such as this one. I have 1 daughter. She’s 7 months old and we are going strong. I plan to breastfeed for as long as I can. I’m glad for anything that draws attention to breastfeeding- it seems like there is still so much negativity surrounding this normal and healthy (and money-saving!!) way to feed a baby. I nursed my oldest until she was 27 months (despite a REALLY hard time early on, with a tongue-tie, raynauds, and repeated bouts of mastitis), and am still nursing my 14-month old twins. I am so glad that I have been able to nurse the twins so long, since it meant much less stress for us every time my oldest brought home some little bug from preschool. They didn’t even catch the stomach virus that landed me in the ER and knocked the rest of the family out of commission for an entire week! My 2 year old self weaned at 26 months and after 1 month decided to regress a little when she started sleeping in her own room. She needs some breastfeeding for her nap and nighttime sleep – a way of checking in again and moving on. I guess my biggest obstacle has been her father and then of course the inlaws who have persecuted me for my decision to offer extended breastfeeding. My husband resents the fact that I give in to my daughter’s regression, threatening that with the next kid things will go “his way”. He blames me for not teaching her better coping skills and making her rely on me, if you can believe that. That has been the most exhausting part of breastfeeding. I will not give in. I feel so bad that mother’s have to endure such pressure to withhold something that children are entitled to. I am so proud of the mothers going strong despite our twisted culture that tries to deny children of this gift but so readily offers toxic substitues, pushing non organic mass produced and adult food early. Its’ great that Mother’s Boutique offers clothing that in a way helps spread the word and makes it “ok”. Keep it up girls!! Yay! Wow, what great comments! breastfeeding rocks! I am an RN, Mother, and training to become a lactation consultant. I wanted to do this because of the wonderful help I recieved from the lactation consultant where I delivered my son. I am convinced that so many more mothers would breatfeed if a lactation consultant were available directly after delivery. I thoroughly enjoyed breastfeeding my son for 13 months. Such wonderful bonding time, wonderful weight loss trick, and not to mention sooo wonderful for his health. I am so happy there is a whole week dedicated to breastfeeding! What a wonderful thing! Rock on mommies! I have three babes. The oldest weaned when he was 26 months and he just lost interest. The middle son weaned at 11 months because I was pregnant and he just didn’t want it anymore. Either the milk dried up, or he didn’t like the taste of it anymore. My third is still nursing, and I hope to continue with her until she is at least 2. I love being a nursing mommy! I have two children. My first I only breastfed for about two weeks, and I’ve always regretted that. My 12.5 week old has been breastfeeding for 12.5 weeks, exclusively, and I’m very happy about that. Okay, a little proud too. We currently have a little game we play where he nurses and i make faces and he tries not to smile so hard that he breaks his latch. Loads of fun. I hope to nurse him until he self weans, whenever that may be, but if asked to put a time on it, I’d hope to make it to two years. I have 5 kids- all happily breastfed… the youngest is still at it. Shonti– we had problems like you are describing with one of my sons. We resolved them with the support of a lactation consultant and the pediatrician. How we handled it is: we breastfed, provided the baby with milk I had previously pumped, and then I pumped again for the next feeding. It solved the problem, although it was not easy. We only had to do this for a few weeks. Good luck! I’m looking forward to seeing the finished pieces! I only have 1 little girl. She’s 6.5 months and we’re still going strong. I want to ‘wean’ her during the day though and still breastfeed morning and night. Breastfeeding is so easy, and so much easier than solid food, that I think if I don’t wean her during the day, I would just keep on breastfeeding forever. Hi I’ve just found your blog a few days ago I wanted to say it’s wonderful. I am following you on Twitter it said to post here for the contest I hope this is the right spot. I have been to see the doctor and he said ‘yes you will feel bad for a while and have you thought of stopping breastfeeding littlun as she has had the benefit for 5 months now’ !!!!!!!!!!!!!! I couldn’t believe my ears. That would make it worse, she is helping me sort it out in her own little way! AND I thought they were supposed to support breastfeeding!!! I will of course not heed his suggestion as BF is easy, so good for baby- no bottles to make and I dont even need to get out of bed if she is hungry in the night, and it is in true money saving style FREE of charge! I have one child and breastfed until she was 8 months. I would have continued but she was the one that made it clear she was ready to move on. I’m hoping our next one will nurse longer. My advice is for you to find another doctor for your daughter. We switched pediatricians between our daughter’s 2 week and 2 month check up and I am SO happy we did! I was not comfortable with the breastfeeding “advice” that the first doctor was giving. Talk to other moms who have breastfed and find out which pediatrician they have used and been happy with. Are you feeding from both breasts at each feeding? If so, try giving her one breast, let her empty it completely. That way she gets the rich, fatty hindmilk. Then, if she’s still hungry let her have the other side. Shonti, like Mommy News said: FIND ANOTHER PED. He cannot compare formula fed babies with breastfeeding babies. There is actually a different table for breastfeeding babies. Pls don’t listen to that doctor and find another ped that supports excl breastfeeding. Shonti, Yes, please continue to exclusively breastfeed! Supplementing with formula can be a downward spiral. Breastmilk contains exactly the right amts of fats for your growing baby. I would suggest increasing your nursing session frequency, (and length, if your baby is up for it). Also, allowing baby to completely drain one side – to get the rich hind milk. Additionally, you DO NOT HAVE TO return to your pediatrician. You DO NOT have to go for a follow-up appointment. You can find a new pediatrician. Or just don’t go until you’re ready. Don’t feel pressured to return just because you made an appointment. Your pediatrician should have breastmilk growth charts, instead of just formula charts – and use the BF one with your child. A pediatrician who doesn’t use both charts is not doing his job. And FWIW, some children just are leaner than others. The most important thing is that your child is healthy, alert, and nursing well & often. And even if she’s in the 10th% (my son is), if she’s typically there, that’s “normal” for her, and in & of itself, 10% isn’t something to worry about. I have two children. I breastfed my daughter for 21months and my son for 27months and am now training as a breastfeeding counsellor to help other mums. I have 2 children. My first self-weaned herself at around 20-21 months. I suspect my milk might have changed a bit as I was about 5 months pregnant with my second. My second is just just over a year and still nursing. I plan to let her self wean as well. I have been happily married for three years and have three children, who were or are being breastfed until they self-wean. My first child breastfed for three years; my second child is still breastfeeding at the age of two; and my third newborn child is also breastfeeding. Having experience as a single teenage mother, married stay-at-home wife, and work-at-home tandem nurser, I am living proof that most mothers can breastfeed in almost any circumstance. Happy Breastfeeding! I have 3 kiddos ~ 1st nursed until 9 months, 2nd nursed until 13 months and last baby just weaned himself at 16 months. I am pleased they all did as well as they did! I am shocked the doctor even implied your baby would not thrive! I totally agree that you should pack up and not visit that doctor again. In today’s society nursing your baby is more tolerated than it used to be, but some still don’t seem it as the best thing (dumb dumbs!). Anyway, all three of my kiddos were thin and lean and always on the low end of the scale. Yet, everyone of them has met or exceeded they milestones! Don’t be dismayed with the doctor, simply seek out a doctor that is known for being a breastfeeding advocate…They Are Out There! Many blessings for you and your little joy. Thank you to everyone for the wonderful advise. I feel blessed to have received so much support. I appreciate all of your suggestions and will use them. I am looking for a new doctor ASAP. I do plan to attend our next appointment, but I will go prepared to have a long discussion with the doctor. Again thank you. I haven’t had a chance to get back to this to leave a message for you until today. I have slow growth babies, but I also have a low supply. What worked for me is breastfeeding often. Frankly, I am wondering how your daughter can only be gaining one to two ounces a week if she is getting 4-5 oz a feeding. Perhaps you could breastfeed her more often. If you are going four hours between feedings, then the baby “might” not be getting enough, but if you fed her every 2-3 hours (which would be 8-12 times a day), perhaps she would catch up! And the previous poster had a good idea, to feed only on one side per feeding, so that the baby gets the good hind milk. I would also see a lactation consultant and/or go to your local LLL meeting, so that you can get someone who can watch you and your daughter feed. They might have some other good ideas! Thank you for your response. I have been working with a lactation consultant since my daughter was 1 month old to ensure that I am doing things corretly. According to the lactation consultant’s records, my daughter is growing well. However, the doctor made a huge ordeal about her weight last month. The amazaing thing is she put on 9oz in a week in a half as the doctor demanded. I didn’t do anything different other than paying more attention to her cues to feed. She fed 10 times a day for several days and then tapered off to 8 then to 7 times. Her feeding scheduled varies between 2-3 hours depending on her mood that day. The least amount of time that she is at the breast is 20 mins. Most times she is feeding 30 min or more. She does have brief periods of rest during the feeding session. Sometimes on my left breast she will on stay for 7 mins. I will put her back to that breast and she will go for a few moments, but is done. Once I place her on my right breast she will be there for 20 mins or more. When my daughter was born, she tipped the scale at 6 lbs 11oz. Her last wieght, approx one week ago was 12lbs 10oz. She should be 13lbs 6oz (double her birth wieght) by her 6 month visit on the 17th of this month. We track her feedings and wet diapers, which the doctor refused to reveiw. I have learned to recognize when she gets let-downs during a feed. My lactation consultant tells me not to worry becasue my daughter is growing well and at her age she should not be picking up 6oz per week. I have visited the Who site to see what she should be gaining, which is 2-4oz per week. The doctor has led me to second guess myself. So, I wanted to get advise and feedback from you experienced mothers and professionals. I hope above inforamtion helps with any additional advise. Thank you so much. My 5 yr old I only nursed until he was about 6-9 weeks old. He had a bottle quickly and learned to love it quickly. 3 yr old I remember very vividly that our trip on an airplane when he was 8 mths old was the last time he nursed. My 18 mth old is still currently nursing. He only nurses at night now, although the last few days he’s been nursing more often. .-= Alaina Frederick´s last blog ..Outside Fun =-.